People of all walks of life have service animals and emotional support animals that improve their quality of life significantly. However, it is not uncommon for landlords and business owners to either misunderstand or ignore the law surrounding the right to own these animals, and condo boards are no exception to the general ignorance on the subject. If you are in a situation where your service or emotional support animal is being used as an excuse to deny you housing or accommodation, you may be able to seek compensation. The second relevant point is that Florida’s law actually criminalizes the actions of any “person, firm or corporation” (or their agent) who denies or interferes with a disabled person’s right to a public accommodation,” classifying it as a second-degree misdemeanor. 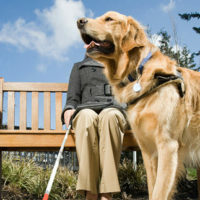 While a specific condo is not considered a public accommodation, areas of the complex that are open to the public are, and any condo owner with a service animal must be permitted access, regardless of any pet policy against it. While emotional support animals (ESAs, also called assistance animals) are clearly delineated from service animals, in reality ESAs must also be accommodated in most respects – but under the Fair Housing Act (FHA), rather than the ADA. Under the FHA, reasonable accommodations and modifications for the disabled is not only suggested, but required, and both ESAs and service animals are considered reasonable accommodations. Disability is one of the protected classes under the FHA, meaning that discriminatory actions against members of protected classes will almost certainly result in violation. It is also worth noting that the FHA specifies that a landlord is not permitted to charge pet fees for an ESA or service animal, though the owner is responsible for any damage done by their animal, regardless of its status. Also, while Florida’s specific statute excludes ESAs from being deemed reasonable accommodations that must be made by condo boards, it does not preclude ESAs from receiving that status under another law (such as the Fair Housing Act). The interplay of state and federal law can make issues with your condo board appear quite complex, so it is generally a good idea to have a dedicated attorney on your side. The Hollywood condo law attorneys at the Law Firm of Steven A. Mason, P.A. are happy to sit down with you and try to help give you the information you need to go forward. Contact the Fort Lauderdale and Hollywood Law Offices of Steven A. Mason, P.A. for legal advice at 954-963-5900 or leave a message online.